The colonial set includes options of a Shift, Panniers or Petticoat. You can find more information and history about all of these items at the product page. I am so excited! The Civil War set has options of a Chemise and Drawers and a Crinoline (or hoopskirt). This set is a little more decorative and very historically accurate. Find out more info at the product page. I am also thinking about having more undergarments, such as a bustle, for the other time periods in the future. Any thoughts? 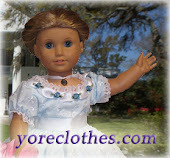 The new Doll Clothes of Yore website is out! I've been working on this for the whole month of April, and it's finally done! I have also put out the 4 new designs that have been waiting for the website to be finished. These are not available yet, but they will be within the next week! And please, if you have bought a dress from us and loved it, leave a review on the dress page (if you can find it - Our dresses sell out quickly). Let us know what you think of the new site! Happy Teusday! 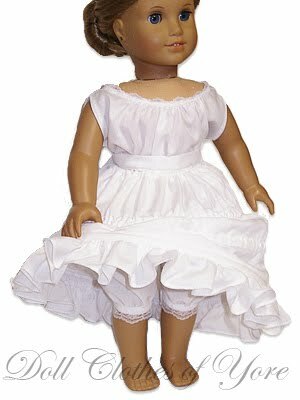 I thought I would explain why there has been so little going on at Doll Clothes of Yore this year. 3 information tabs instead of 2. Right now I have 'Product' and 'History'. I want to have 'Description', 'History', and 'Fashion'. The 'Description' tab will have all the information about the dress, just as the 'Product' tab does now. The 'History' tab will have information about the product's name. 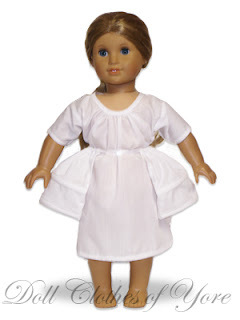 For example, the 'Clara Barton' Dress will have a whole tab on Clara Barton, instead of just a few paragraphs. This will allow me to do more justice to the people, places, and things that inspire my designs. The 'Fashion' tab will have information about the fashions of the time period. This, I hope, will become a valued resource to anyone interested in period clothing. A search engine that will allow customers (and anyone else) to search for particular things, such as 'ball gowns'. Unfortunately, because of the amount of work that will go into this, I will be a little slower than I would like in getting out my new designs. I am also using this project as a homework assignment (for a college class). It's due the end of April, so hopefully by then the site will be completed. Thanks in advance for your patience! In the meantime, I will be writing a bit on this blog about new designs, ideas, and other things.